Both feed-in-tariffs and competitive auctions are playing an important role in procuring on-grid renewable energy for Sub-Saharan African countries. Innovative energy solutions are needed to help address Africa’s infrastructure shortfall, which has resulted in over 600 million Africans that still lack electricity access. In response, a number of countries in the Sub-Saharan African region now encourage greater involvement of Independent Power Producers (IPPs) through various renewable energy policies and support programs. These policies and programs are often uniquely designed and customized for capacity needs and available resources of the region. While once-off negotiated concessions between governments and IPPs are still common, this approach comes with many risks when not coordinated with holistic infrastructure plans and can result in long-term overpriced contracts for electricity. Fly-by-night developers may be the first to approach local government and push for a project, but government has a responsibility to compare that project to the cost of alternative procurement options and its impact on rate-payers. A more organized approach to procuring renewables is often needed to ensure the best projects are transparently chosen and built. 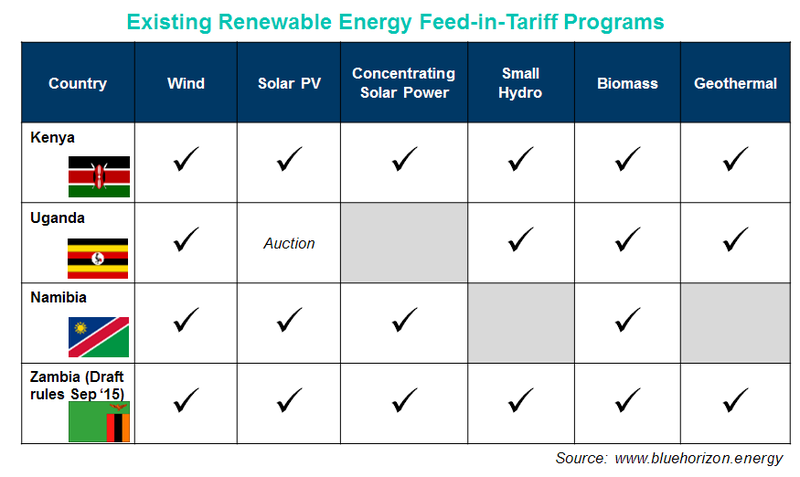 The two most common and successful programs enabling renewable energy IPPs in the region to date have involved either a competitive auction with long-term power purchase agreements, or renewable energy feed-in-tariffs (REFiT) for various generation options. These programs come with their own unique pros and cons. REFiTs tend to be simpler and work better for small/medium scale projects (e.g. <20MW) where the cost of a competitive auction program isn’t justified. For example, Kenya has had a feed-in-tariff for several years and differentiates tariff amounts based on project capacity (typically above or below 10MW) and resource/technology used. REFiTs, however, rely on accurate cost estimates for tariffs, which can be challenging for rapidly advancing technologies like solar PV. To resolve this, Uganda opted to replace its solar REFiT with a competitive auction early this year to keep up with dramatic price drops seen in the industry in recent years. Zambia is also diversifying its energy mix and published draft REFiT rules in Sep 2015 for small/medium scale projects (<20MW). While most renewable energy resources are included, the program details have yet to be finalized. Further clarification is also needed on how the program will integrate with other initiatives in the country like the World Bank’s IFC Scaling Solar Initiative (2 x ~50MW Solar PV projects likely procured through PPP auction) and KfW’s potential Global Energy Transfer Feed-in-Tariff (likely to be a top-up to existing REFiT values as in Uganda). Regardless, Zambia’s president sounds committed to renewables, and solar in particular, announcing his intent to procure 600MW of solar as quickly as possible. This urgency is understandable, given the current drought’s impact on hydropower output and economic impacts of load shedding in Zambia. Embedded generation tariffs are another form of REFiT for small-scale generation and often used as an alternative to net-metering in some regions such as South Africa. Several municipalities in South Africa currently have an embedded generation tariff for small-scale projects (<1MW). These amounts vary by municipality and are adjusted annually with regulatory approval. South Africa’s National Energy Regulator (NERSA) solicited feedback in early 2015 on a consultation paper for national embedded generation regulatory rules, and while release of the final rules has been delayed they’re expected to be published before the end of the year. Competitive auctions, like South Africa’s Renewable Energy IPP Procurement Program (REIPPPP), have been very successful at incentivizing competitive prices and attracting international investment from IPPs despite some delays. Auctions, however, are costly for both the administrator and bidders, so only large utility-scale project (e.g. >20MW) are often worthwhile. Projects from the REIPPPP tended to be fairly large with averages of 68MW for solar PV and 111MW for wind projects in Round 4. Auctions can also create a challenge for T&D expansion, as projects tend to locate near the resource rather than near customers. The Northern Cape, with significant solar resource, now hosts the most solar capacity from South Africa’s auction. While competitive auctions have lately proven more successful at ensuring fair PPA prices especially for large-scale projects, both REFiTs and auctions will continue to play an important role for Sub-Saharan Africa’s energy sector in coming years if rolled out in a stable and transparent way. In addition, governments that want to rapidly address infrastructure shortfalls in the region should remove regulatory barriers to customer-sited generation (both on and off grid), and encourage greater grid flexibility for distributed energy resources that add the most value for its citizens. © 2019 Blue Horizon. All Rights Reserved.